In addition to China and Australia, Great Britain also released its own UK Lunar series for the first time in 2014. In high-quality 999 fine gold, the Royal Mint depicts the respectively current zodiac sign of the so-called lunar calendar each year. In the third year, the UK Lunar "Year of the Monkey" 1 oz gold 2016 was released. Thus following its predecessors, the "Year of the Horse 1 oz Gold 2014" and the "Year of the Sheep 1 oz Gold 2015". 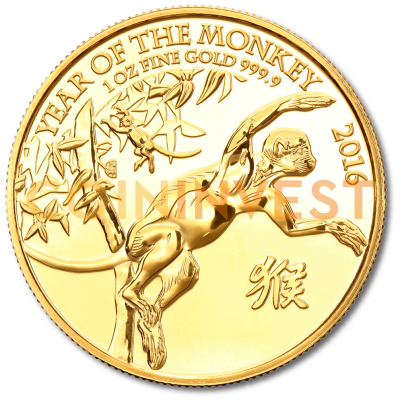 At CoinInvest, you now have the opportunity to buy this beautiful edition of the UK Lunar Year of the Monkey 2016 gold coin. In our online shop you will find a well thought-out wide range of current and older coin issues in gold, silver or platinum. And if you wish to sell your coins or gold bars, CoinInvest is the right point of contact for you. Write us an email or contact us by phone and we will find the best current price for your coins or bars. The Shēngxiào collection, which is the official name of the UK Lunar gold coin series, was first released in 2013 by the Royal Mint. The calendar coin motifs are dedicated to the current zodiac sign of the Chinese lunar calendar each year, which also give the coins their names. Whereas the zodiac signs change every 30 to 31 days in European astrology, in Chinese astrology a single zodiac signs applies for one full year and gives its name to this period. With the five elements, the zodiac signs form a calendar cycle lasting 60 years. Six editions are planned in total in the UK Lunar Gold series up until 2018; whether a further edition will follow the last "Year of the Pig 2019" edition is not yet known. In addition to the gold edition, the UK Lunar coin series is also available as silver coins and bears the same motifs. The interpretation of the stars is deeply rooted in Chinese culture. It is said that in 2016, on 8 February at full moon the ghosts of the elements and animals will unite to form the coming year and exert their influence on it. In 2016, this animal is the monkey, a fast and sociable animal that will add its own touch to the calendar year. As was the case for the two previous editions, the British artist Wuon-Gean Ho also designed the motif for the current UK Lunar Year of the Monkey 2016 gold coin. The coin is made of fine gold with a purity of 999/1000 and depicts two monkeys on the motif side. The larger of the two animals is in the viewer's line of sight and swings from a tree on the left edge of the image into the middle of the image without his goal being visible. Between the branches of the tree in the background, another small monkey who appears to be swinging along between the leaves can be seen. The depiction of the animals is captivating in how naturally it has been executed together with the suggestion of the monkey's natural habitat. To the right next to the monkey, the Chinese characters can be read, which state the name of the animal and the coin. An inscription over the motif states the name of the coin in the national language of the country of issue, "YEAR OF THE MONKEY", and the year of issue, "2016". As with all British coins, the front bears the portrait the Head State, Queen Elizabeth II. Editions minted after 2015 bear a design by Jody Clark, who has adapted the portrait of the Queen to be age-appropriate, thus giving it a very special charm. The inscription states the legal tender value of "100 Pounds" as well as the name of the depicted monarch "ELIZABETH II" with the additional abbreviations "D.G. REG FID DEF" referring to the Latin words "Dei Gratia Regina Fidei Defensor" (Queen by the grace of God, defender of the faith). Due to the limited edition of 8,888 units, the UK Lunar Year of the Monkey 1 oz Gold 2016 coin is not only an attractive item for collectors. As the coins in the UK Lunar series are gold coins with the potential to increase in value, they also offer investors interesting options. You can now secure this beautiful gold coin for your portfolio and order easily using the button in the price field above. At CoinInvest, you receive the UK Lunar Year of the Monkey 1 oz Gold 2016 in a single coin bag and in the case of larger quantities in tubes of 10 coins.